Ride the G: to Cavill Avenue Station, then a short walk to The Hilton. This Valentine’s Day, share in a sumptuous and sophisticated dinner for two at the Hilton Surfers Paradise’s Executive Lounge as you take in exquisite ocean views. For $250 per couple, lucky lovers will be treated to a glass of Champagne on arrival and a signature Seafood Platter for Two, delivered straight to the table fresh from renowned Catch Restaurant. 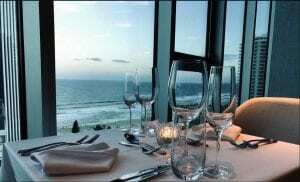 To complete the romantic evening, you will indulge in a divine dessert as you look out to see the Surfers Paradise skyline come to life. Book now by emailing eatdrinksurfersparadise@hilton.com.